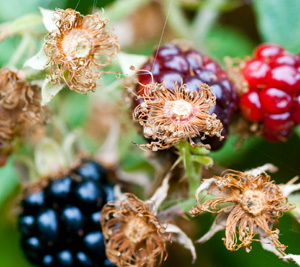 This is your last chance to pick your blackberries. Michaelmas (29th September) is, by legend, the day the Devil spits on them, making them inedible. Another version of the story is that a bramble patch broke his fall from heaven. There is a lot of tannin in brambles and perhaps after the 29th, at the end of their season when they start to wither, they are too bitter. They are pretty much over, here in the south-east, but may have a week or two left further north. Everyone loves blackberry picking – there is something very satisfying about searching through the tangle of thorns for the fattest, glossiest fruit.It’s often the first wild food children come across, found both in country and town. A good picking session with plastic bags at the ready was a feature of my childhood, autumn half-term holidays in Scotland. 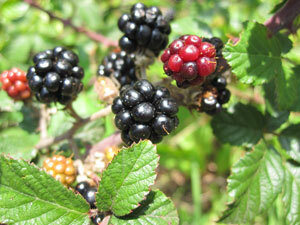 (The Scots refer to the fruit and plant interchangeably as “brambles”.) There are plenty of brambles in our local park, and there was a big patch under the railway bridge until they were cleared away in a fit of tidiness.I’d give any fruit picked next to a road a good wash though. What can you make with the fruit you have picked, apart from the usual jam and apple and blackberry crumble?My parents used to make a very good bramble wine,like Merlot, but we’ve lost the recipe (- anyone out there got a recipe? ).They freeze very well so you can store them for later.This year I experimented with a blackberry sorbet and recommend it highly – it really captures that rich, aromatic, winey flavour.Quite a grown up ice, although the kids lapped it up too.Here is the recipe, with acknowledgements to Caroline Liddell and Robin Weir’s “Ices” (pub.Grub Street). Pick over the blackberries for bits of leaf, insects and other detritus, and give them a wash if you’re dubious about car fumes, dogs, etc and dry them.Put them in a non-reactive pan with the sugar and water and bring to the boil, simmering for 2-3 minutes until the fruit has started to release its juice.Allow to cool and then liquidise in a blender or food processor (or just push through a sieve).Strain to remove the seeds and debris.Allow to cool then add the alcohol and the lemon juice.Cover and chill.When cold, either pour into your ice cream machine or pour into a shallow plastic container and put in the freezer.Take it out every hour and break up the ice crystals formed around the edge with a fork until it’s the consistency of a Slush Puppy – about 4 stirrings – and then put it back in the freezer to firm up.Take it out about 20 mins before you want to eat. Just made this sorbet (something of a glut of blackberries in Norfolk!) and it is absolutely delicious. Thank you! I made this sorbet and served it to guests between the starter and main course as a palate cleanser. We did feel posh! The meal was a ‘Taste of Scotland’ themed evening and the sorbet was a perfect touch of class and a nice wee surprise. It is so wonderful to find tales and memories of blackberry picking from all over the world. These amazing free fruits are so good for you as well and are rated at the very top for antioxidant powers as well as contain high levels of folic acid. A good combination for the blackberry sorbet is a passion fruit sorbet. It makes a dramatic color combo and a great tasting sorbet! Blackberries is something I miss from living in London! Here we can buy them frozen though. It’s great for smoothies and simple sorbets – we keep a box of various frozen fruits in the freezer, bits of banana, apple, pineapples, berries etc. and just put a selection in a blender with some yogurt or juice to eat. It makes a nice ice cream texture and is delicious and healthy – 100% fruits, no sugar or fat required.